Walk-In Flu Shots EVERY DAY! #1 You can catch the flu from the flu shot. FALSE. You will not get the flu from the flu shot. The flu vaccine is made up of proteins that inactive viral particles attach to, meaning it contains no live virus. Your body produces protective antibodies to fight these particles so you may experience some side effects like a mild fever or muscle aches. However, it does take 2 weeks for your body to form the antibodies to the vaccine to fully protect you. So if you do pick up something in that time frame, don’t blame your sore throat or cold on the shot. #2. You don’t need to get a flu shot every year. FALSE. Strains of influenza caused by the most common viruses change every year. So to stay protected you must stay current on your flu shot. The current year’s vaccine is made to protect you for up to four flu viruses believed to be the most likely to spread. #3. The “stomach flu” is related to the seasonal flu (influenza). FALSE: The “stomach flu” , Norovirus, has no connection to influenza. Norovirus is an intestinal illness while influenza is a respiratory illness. Digestive stresses (vomiting and diarrhea) are rarely symptoms of influenza as with Norovirus. #4. Healthy people don’t need the flu shot. FALSE. Everyone should get a flu shot. Even the healthiest people because there are new strains every year. You are more likely to pass the virus along if you don’t have the vaccine putting others including your loved ones at risk. The more people that get the shot, the less amount of influenza there will be circulating around. And the excuse that you’ve never gotten a shot and you’ve never gotten sick will eventually catch up with you! #5. You can stop the flu by washing your hands a lot. FALSE. Yes you should wash your hands. It’s a good practice to protect from spreading germs on a daily basis. But it’s not enough to stop the flu. Influenza is spread through the air via droplets of saliva and on contaminated surfaces. It’s a good idea to stand at least six feet away from anyone with the flu as the airborne droplets from a contaminated person can’t travel that far. Also, be sure to disinfect common areas of your home or workplace if some with the flu spent time there. The flu can live up to eight hours on surfaces. It’s best to try to not touch your eyes, nose or mouth even after washing your hands. Above all, the best way to protect yourself is to get vaccinated. #6. If you get the flu, the shot didn’t work. FALSE. Usually the flu shot is 60-90% effective. This is due to the fact that there are multiple strains circulating each year and it’s hard for researchers to predict which ones with be the most dominant. There is an upside even if you do get sick: your symptoms should be less severe because the shot you received should fight the virus at some level. And if it prevents hospitalization or death, the CDC considers it a success. #7. Antibiotics can fight the flu. FALSE. Antibiotics do not work on viruses. However, antivirals like Tamiflu might help and could cut the course of the virus by 1-2 days if taken within 48 hours of the first sign of symptoms. Prevention with a flu shot is a better approach. However should you become infected the best advice is to stay home, get plenty of rest, and drink a lot of fluids. #8. You’re only contagious in the first 48 hours of the flu. FALSE. Even if your symptoms start to subside after a couple of days you may still be contagious. Most healthy adults may be able to infect others beginning the day before symptoms even develop until up to 5 to 7 days after getting sick. Children tend to be contagious longer than adults. If you have the flu, you should stay home for at least 24 hours after your fever is gone with the use of any fever-reducing medicines. #9. If you didn’t get the shot by January, it’s too late. FALSE. There is no set date for when a flu shot is ineffective. As long as influenza is circulating and people are continuing to get sick in your area, it’s not too late to get the vaccine. Flu season tends to begin in October or November and peak anywhere from December to February but has been known to occur as late May. So if you haven’t gotten your flu shot, it’s not too late! #10. If I don’t have any symptoms, I’m not contagious. FALSE. Most people become contagious starting one day before they develop symptoms and lasting until about 5 to 7 days after getting sick with the flu. This can last even longer in children. You may even be contagious even before you know you are sick since symptoms start 1 to 4 days after the flu virus enters the body. #11. I have to go to my doctor to get a flu shot. FALSE. There’s no need to have to make an appointment at your primary care physician to get your flu shot. AuBurn Pharmacy offers walk-in flu shots every day! No appointment necessary! Do you currently come to the pharmacy multiple times per month to pick-up maintenance medication? Do you run out of refills and consequently medication waiting on the doctor to respond to refill requests? If so, you will be interested in Advantacare, AuBurn Pharmacy’s refill synchronization. By synchronizing medication refills this allows for scheduled pick-up along with advance notice to your Doctor for refill authorization. Healthy Habits…Healthy Children…Enroll your Child TODAY! Download a form and Enroll your child today! AuBurn Pharmacy offers specialized diabetic shoe fitting services. Measuring and assessing the needs of a patient’s feet to aid in proper footwear selection. Along with yearly foot exams, having properly fitted footwear by a qualified foot care professional is a necessary and integral part of a diabetic persons foot care. Proper footwear helps to prevent serious complications associated with diseases of the diabetic foot. The following are current locations that offer diabetic shoe fitting services. Membership is FREE, Enrollment is Easy! Download a current list of Generics in the discount program. To protect against computer viruses, e-mail programs may prevent sending or receiving certain types of file attachments. Check your e-mail security settings to determine how attachments are handled. • You can pay online. Over the age of 50? Were you exposed to chicken pox? Like 98 percent of people, you probably answered yes to that question. This means that you already have the Shingles virus living in you. AuBurn pharmacies in collaboration with physicians want to raise awareness about Shingrix, the relatively inexpensive vaccine to reduce risk of having an outbreak and if one does occur lessen the effects. 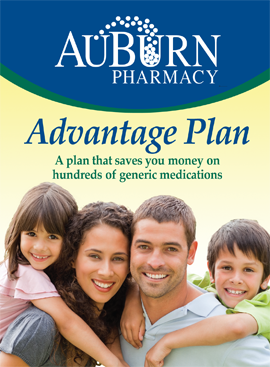 AuBurn Pharmacy is able to check benefits or out-of-pocket with your insurance, which typically ranges from $0-220. Vaccine is kept on hand at each of our locations. Talk to your local AuBurn Pharmacy team about getting vaccinated today. AuBurn Pharmacy offers FREE Diabetes education classes. Click here for the Team AuBurn Landing Page. 1111 visitors like this page!